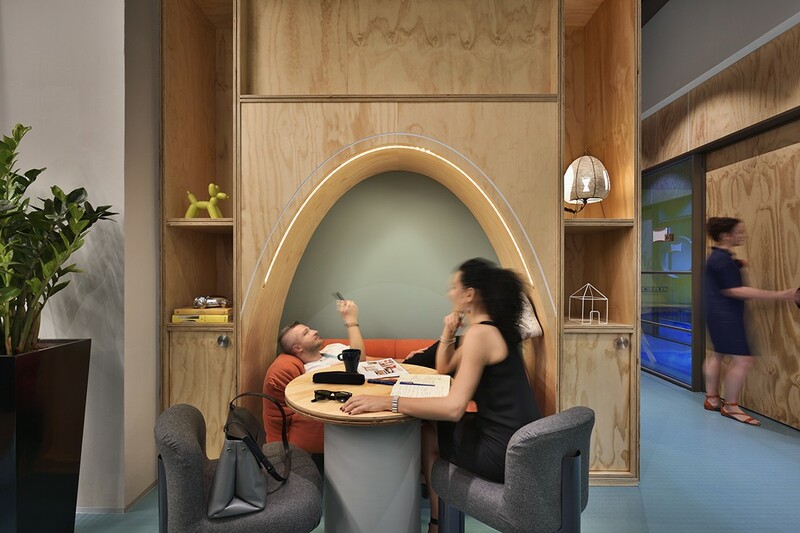 Has co-working been up-staged by the pervading popularity of an out-of-office culture? The answer is, not quite yet! 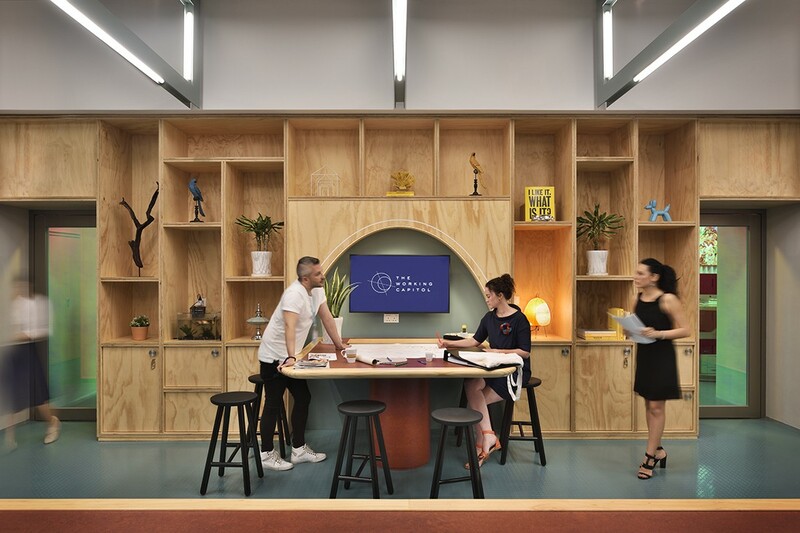 In its latest design for The Working Capitol Robinson Road Singapore, HASSELL expertly subverts pop culture tropes to re-envisage co-working as a progressive yet playful model. 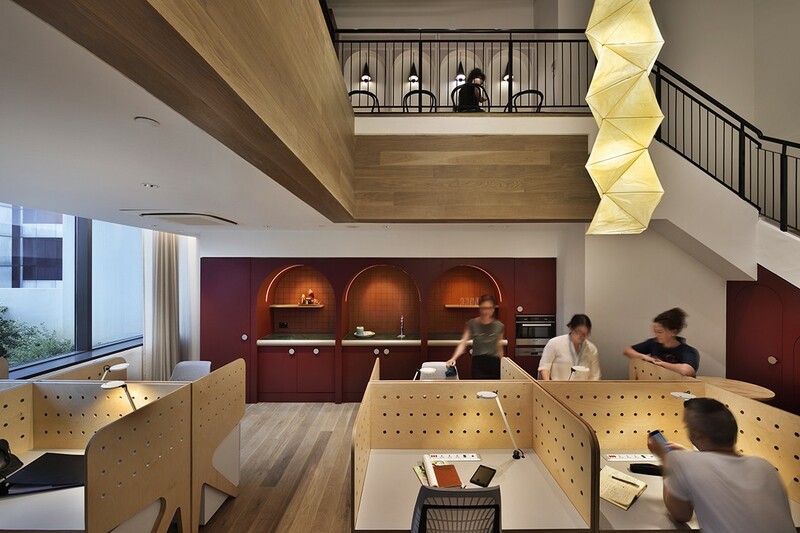 Dichronic lighting sets a futuristic feel in the co-working space. Imagine that Friday night overtime crunch: you’re hunched down at your desk, a lonely figure lost in the open-plan of just another high-rise tower office. And then you hear curious, excitable sounds coming from a nearby fellow occupant. Not something you expect to hear from your isolated office space. Looking out towards a neighbouring office tower, you spy a party of people milling in a double-height open space carved from the tower façade. Decked with greenery and a pool with giant animal floats, the scene seems like a mirage, conjured by your fatigued Friday night. But it’s not. 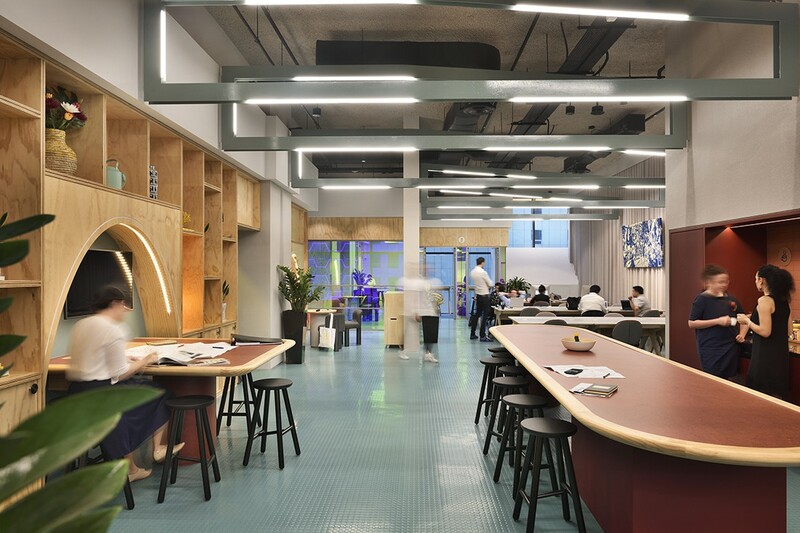 ‘That office’ is The Working Capitol at Robinson Road, Singapore’s latest and hottest co-working address in the Little Red Dot. The party: a scene from their opening night. Designed by HASSELL, TWC at Robinson Road occupies 11 out of 19 floors of the Crown at Robinson, a newly built Neo-Artdeco commercial building designed by Ong & Ong. The premise is TWC’s second outpost on the island. 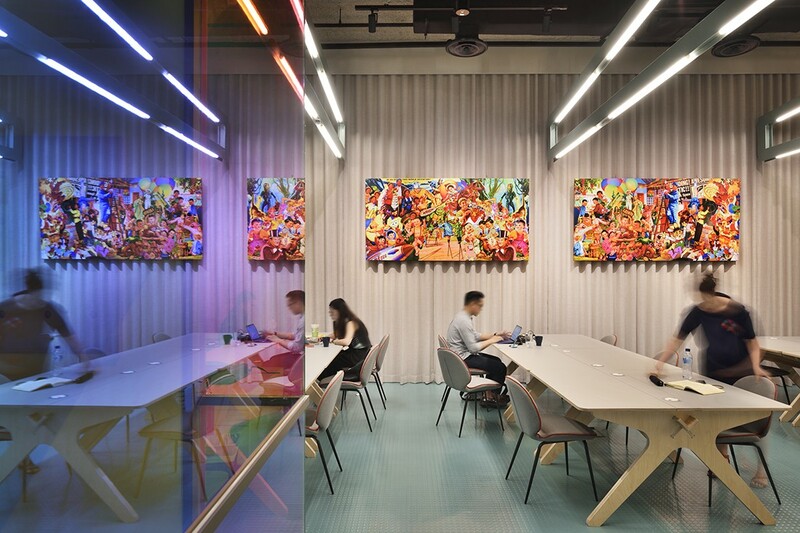 TWC entered Singapore’s commercial scene in 2015, where co-working wasn’t regarded as a progressive lifestyle choice so much as it was a necessity for start-ups to offset Singapore’s premium rental. 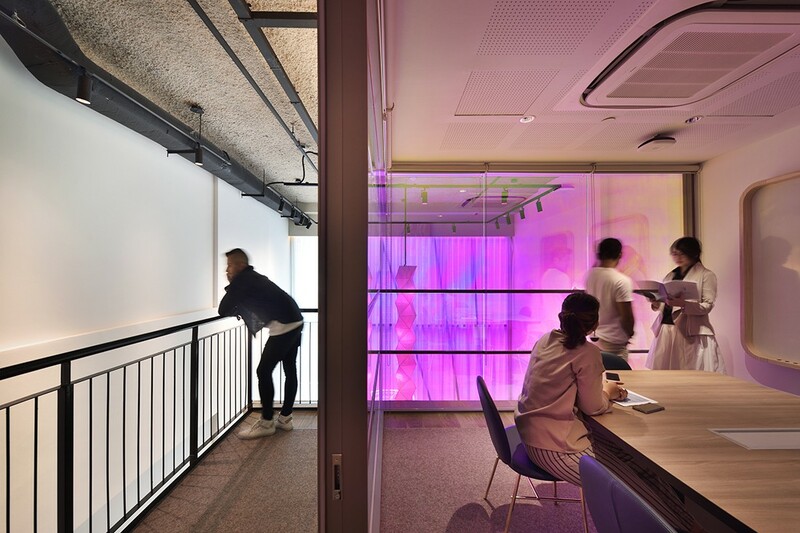 The first TWC took over five shophouses along the city’s historic Keong Saik Road and (in collaboration with Takenouchi Webb, FARM and Foreign Policy Design) turned them into an exciting co-working space that has fostered a vibrant and equally exciting community. It was one of the key institutions that made co-working cool in the Little Red Dot. A great sequel is hard to make, and it is especially challenging after a stellar debut. A great sequel is hard to make, and it is especially challenging after a stellar debut. TWC at Robinson Road could have easily followed that all-too-familiar Hollywood narrative: small Indie production- turned-cult classic receives huge capital only to spawn a soulless sequel. Thankfully, HASSELL has expertly subverted this trope by not only staying true to the character of the original TWC but also cultivating a compelling character development. A big part of TWC’s appeal is the way the space makes you feel at home. 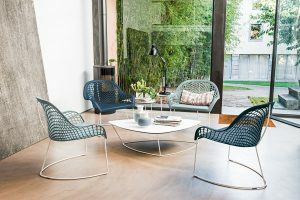 The main question that HASSELL needed to answer for TWC at Robinson Road, says Sampson, was how to bring over this intangible element – its soul, if you will – from the shophouses of Keong Saik to the concrete shells at Robinson Road, without it becoming a pastiche of the original. 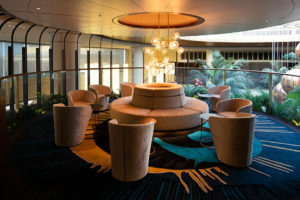 With more than twice the real estate of its first branch, a five-metre height between floorplates, and amenities including a 20-metre outdoor lap pool, a gym run by a boutique fitness operator, and a lounge and event space incorporating a bar, TWC at Robinson Road is every bit the picture of a Millennial CBD establishment. Yet, upon entering, one can immediately feel the friendly, almost residential feel of the space. 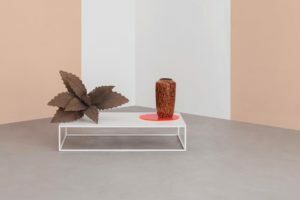 “We wanted to create a sense of domesticity through the materials and the layout,” says Sampson. HASSELL organised the large floor spaces into the more human-scaled rooms and zones using a distinct geometric language of plywood arches and framing. This went a long way toward recalling the scale and architectural details of the shophouses at Keong Saik. 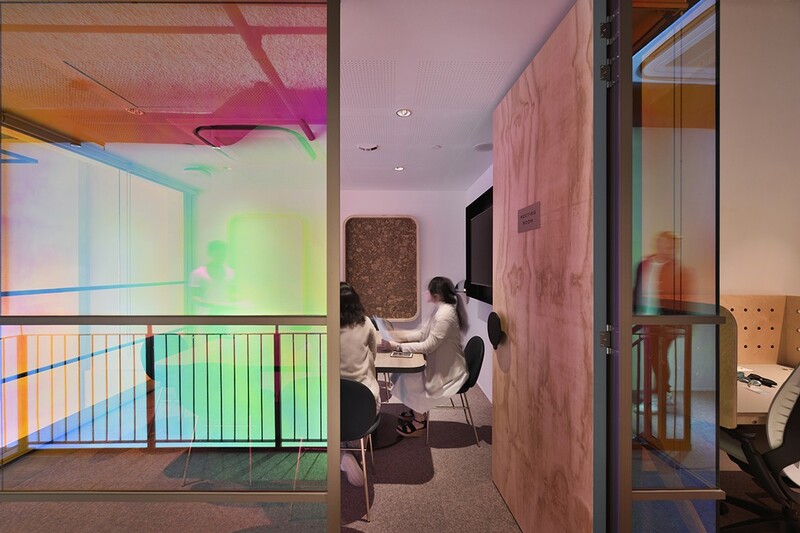 The material palette uses plywood and paper to soften the interior and pairs them with fresh solid colours and dichroic film on glass for a dose of fun and richness. The floor stacking alternates between collaborative floors and quiet floors, topped by penthouse floors offering duplex units. 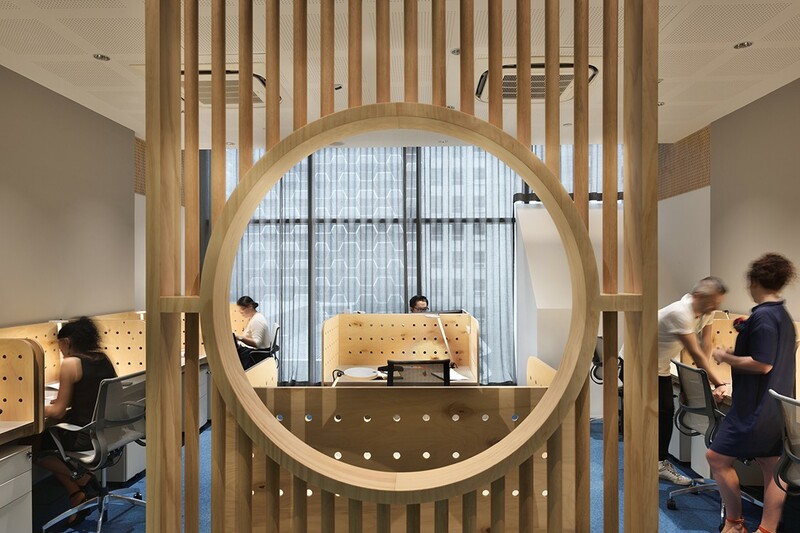 On the collaborative floors, visitors are welcomed in breakout areas, flanked by communal workbenches. 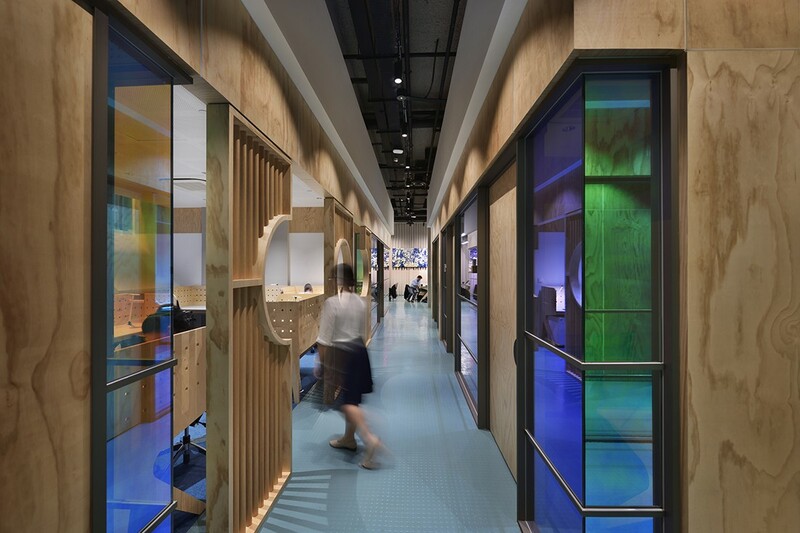 Workspaces in varying capacities line the corridors. High above the rubber flooring, the ceiling is brought down to a more intimate scale by trusses fitted with custom LED lighting. Dubbed ‘The Pindrop’, the quiet floors sport a similar layout but vary in the details to create a more muted-style of ambience. 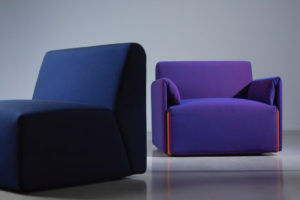 In place of breakout areas there are cosy nooks with single sofas. The colour palette is noticeably cooler and the rubber flooring is swapped out for carpet. 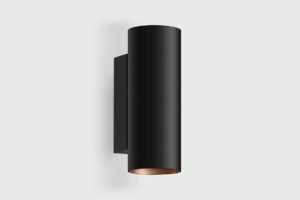 Entry is discrete – through the side doors. And in a rather cute display of kitsch and personality, both floor types have unisex toilets. 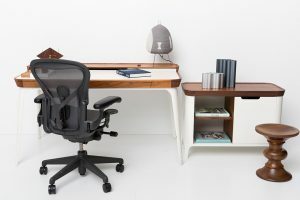 But like everything ‘fun’ in the space, it also serves a purpose: “It’s both a way to save space and to foster another kind of collaboration. Remember the unisex toilets in Ally McBeal?” quips Sampson. In a rather cute display of kitsch and personality, both floor types have unisex toilets. 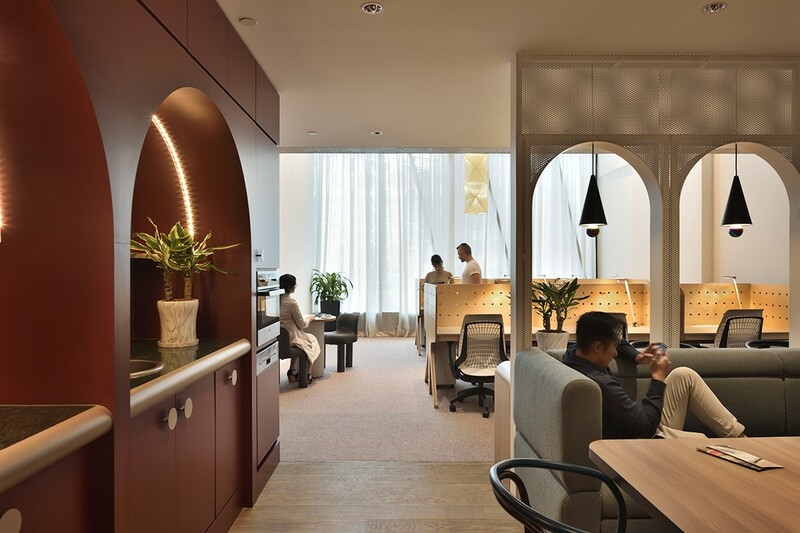 All in all, The Working Capitol at Robinson Road is a strong sequel that has cultivated the comfort of familiarity, while owning a distinct, compelling character that is very much needed in a competitive co-working context. Definitely a cult-classic. See all the products specified in The Working Capitol. A view projects from the HASSELL archive. Want more stories like this straight to your inbox? Sign up for our newsletter. The Working Capitol is just one example of killer Singaporean design. See even more by joining us in Singapore for the 2018 INDE.Award Gala, book a ticket now.